MANILA, Philippines - The fight is on! Former matinee idol turned brawler Baron Geisler will face Indie Actor Kiko Matos in a celebrity exhibition match at the URCC Fight Night to be held tomorrow, June 25 at the Valkyrie Super Club in Bonifacio Global, Taguig City. After the official announcement of Asia’s longest running MMA league’s president, Alvin Aguilar, the two protagonists have been itching to face each other inside the caged-ring to settle their very controversial bar feud. Last month, a video of Matos and Geisler’s bar fight went viral. It was not the former Tabing Ilog’s main cast’s scandal but this is probably the most hyped and most talked about among his infamies. URCC’s Aguilar, during one of the event’s presscon invited both Matos and Geisler to fight legally under the main bout between Alvin Chan and Chris Hofmann. The netizens were too quick to react after the said announcement and clamored to make the match happen. As per URCC insiders, ticket demand went sky-rocket high and they had to extend the area of the venue to accommodate thousands of spectators. Just few days after the invitation, both Matos and Geisler accepted the challenge and called each other out on social media. Alvin Aguilar however asked the two a condition in order for the fight to happen: they have to reconcile first publicly. Baron posted his taekwondo training online under the supervision of his brother Donnie, a former national taekwondo jin who brought honor in the country several times as a warning shot to his nemesis. Just this morning, both have been weighed-in in front of the media people. 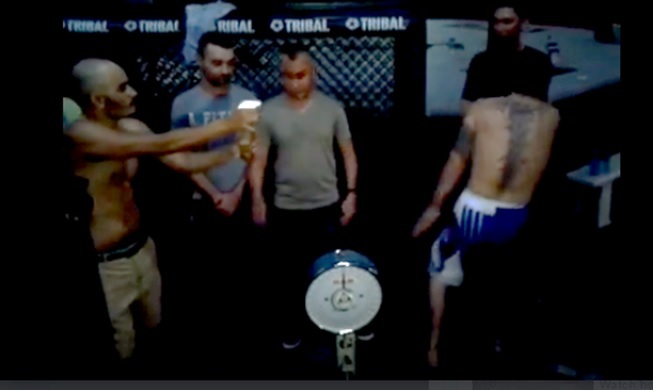 But the pre-fight just got heated-up when Kiko Matos sprayed his own pee at Baron Geisler. It was immediately followed by trash talking, cursing and a little bit of punching and shoving. The two celebrities will be slugging it all out for two rounds with three minutes each round and a minute break under the guidance of a professional MMA referee and judges. The whole URCC event tomorrow night might probably break the league’s record in terms of ticket sales. Fellow celebrities and athletes will definitely will be in attendance to watch the epic battle.